Colonel John "Hannibal" Smith -- leader of the team, a cunning master of disguise. Captain H.M. "Howlin' Mad" Murdock -- the resident helicopter pilot, who may or may not have been insane. Lieutenant Templeton "Face" Peck -- the "charmer" of the team. Sergeant Bosco "B.A." Baracus -- played by Mr. T, he was the team's strongman with a famous fear of flying. Each episode would start with a bunch of innocent people being menaced by a bunch of people with guns, who want their land, water, taxi company etc. They would go talk to a man who they thought would get them in contact with the A-Team. Most of the time, it would turn out to be a member of the A-Team -- Hannibal in disguise. They would go along to the location of the activity in their Cool Car, which in their case was actually a distinctive-looking custom van -- an odd choice for a group who are supposed to be in hiding. There they would do a lot of A-Team Firing, beat up the baddies and often MacGyver up an armored vehicle over the course of an A-Team Montage. The show ran for five seasons, with several minor cast changes along the way; the show's eventual decline was attributed to the constantly-recycled and extremely formulaic plot. Attempts to win viewers back, by both changing the overall premise and having the A-Team overseen by a former antagonist, worked for only a short while. Logic and credibility were usually ignored for the series' trademark over-the-top explosions, but the show never took itself particularly seriously, anyway: most of Hannibal's disguises were paper-thin, the villains were usually mostly-inept and somewhat one-dimensional, and the weapons that the Team cobbled together from miscellaneous parts were invariably more effective than the machine guns that the episode's villains used. A big-screen version was released in June 2010, with Liam Neeson, Bradley Cooper, Sharlto Copley and Quinton Jackson as the team. The trailer can be seen here. Tropes go to the respective page. A-Team Firing: Nobody is ever shot in one of the shootouts. A-Team Montage: ...at about the 48-minute mark in every episode. Action Film, Quiet Drama Scene: Believe it or not, the series had a few of these. The most notable is the Season 4 finale, involving their pursuer General Fullbright enlisting their help to go back to Vietnam to find his illegitimate daughter. The humor of the show is replaced by a somber mood, as the team reflects on their experiences in Vietnam. Murdock: No kippers, no herring-bone tweed, no Rolls Royce tire caps, no original pressings of "Hey Jude!!!" Badass Crew: A prototype example. Maybe the first in prime-time TV. Balloonacy: The team once escaped from prison in hot air balloons made from garbage bags, hair dryers and hairdresser's chairs. It was Murdock's idea, of course. Hannibal: Murdock, how'd I let you talk me into this? Balls of Steel: A bad guy slams his rifle into BA's crotch with no effect. Band of Brothers: The main characters due to their shared combat experience. Bar Brawl: Multiple episodes, usually when the team is facing off against the villain of the week. The Barnum: Face genuinely reveled in being a Con Man, and never showed signs of wanting to reform. He seemed to love the scheme just as much as the payoff. Fridge Brilliance: Face, though not a coward by any stretch, often showed signs of not liking violence that much. He probably likes trying to con people so they can get away without a shootout or fistfight - not that he doesn't enjoy the con for its own sake, mind you. Big Damn Heroes: Look in a dictionary and if Mal Reynolds' picture isn't next to the definition, chances are a picture of these guys is. Murdock: The tennis courts are night-lit, there's an extra putting green there, that's the front nine, and that's Faceman chasing someone into the rough. Briefcase Full of Money: And Face comments that it sure would be tempting to just take the money and run. Hannibal talks him down, but is clearly tempted himself. Building Is Welding: All the time. Sometimes taken to ridiculous extremes, such as when the team welds together a restaurant as part of their scheme to trick the villains. California Doubling: Especially egregious when California doubled for South America, Africa, and/or Borneo. Can't Get in Trouble For Nuthin': The team in "Pros and Cons", trying to get into prison, until they crash their car into the police station. Casanova Wannabe: Murdock in "Mind Games". He said, "I ain't goin' on no airplane!" Chase Scene: At least one per episode. Amy Amanda "Triple A" Allen, a newspaper reporter who assisted the team in the first season and part of the second. She was eventually sent to Jakarta "on assignment" when conflicts between Culea and the producers led to her departure (either by firing or her simply getting fed up at having no dialog). The role of The Chick was next filled by Suspiciously Similar Substitute, Tawnia Baker, for the rest of season 2 and early portions of season 3 before she got married and moved to LA, with no new actress brought in to fill the archetype for the rest of the series. The new character of Tia was set up at the very end of Season 4 to become this, but due to the actress's contractual obligations, she was never seen or mentioned again. According to both Dirk Benedict and George Peppard, Triple A and her counterpart were there only because of studio demands, and the male leads felt that a female on the show slowed the action down too much. Chick Magnet: Face can attract women even when he's trying to focus on someone else. Chinese Launderer: One of Hannibal's most-referenced comic disguises. Clear My Name: The premise of the fifth season, though it never came to be before the show was canceled. This is also what forced the team into hiding. "The Crime They Didn't Commit" was eventually revealed to be a bank robbery in Hanoi, Vietnam, which they were in fact ordered to do, but the man who gave them the order was killed and all evidence of his orders destroyed. In the fifth season premiere, they were cleared of the robbery when a former Vietnamese colonel testified in their court-martial that their commanding officer sent them to rob a bank in order for them to be captured by the North Vietnamese. 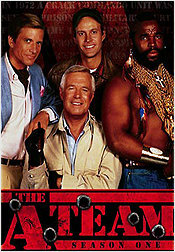 Of course, by that time the A-Team was being tried for the murder of their commanding officer. Clothing Damage: Played for laughs. To impersonate a gangster and infiltrate a meeting, the team kidnap him and send Murdock in with his clothes. The gangster escapes and blows Murdock's cover in the middle of the meeting, but stops people from shooting him so as to not damage his clothes. Complaining About Rescues They Don't Like: Faceman uses one of Hannibal's cigars to escape from a villain's limo in "Steel", much to Hannibal's dismay. Con Man: Face, who also operated as the team's Fixer. Consulting Mister Puppet: Murdock sometimes converses with a sock puppet. Another great way of annoying B.A. Cool and Unusual Punishment: One episode has the team knocking out B.A. (again) so they can get on a plane. This time however they're in the middle of a mission, so they can't wait for him to calm down. Hannibal decides that the only way to solve the problem is to let B.A. take his revenge on them after the mission is over, which Face and Murdock are horrified about. B.A. is creepily cheerful throughout the rest of the episode, and the Team dreads what he'll do to them. Finally, when it's all over, B.A. prepares to punish them. He lines them all up and calls them out on their flaws and why they annoy him. B.A. also reveals that instead of flying back, he's chartered a boat. As part of their payment, the rest of the team has to help with the upkeep as well as repaint the whole thing. The team decides they would've preferred if he had just beaten them up. Their black van with custom red trim. Face's white Corvette with the big red stripe counts, too. Corrupt Hick: To judge from this show, every small town in rural America is controlled by one of these. Or was till the A-Team passed through. Could Have Been Messy: Every episode has a scene where the A-Team and their opponents exchange billions of rounds of gunfire. Nobody is ever shot. EVER. Averted in the season four finale. Fullbright is fatally wounded by a Vietnamese general as the team makes their escape, and Hannibal retaliates by blowing up the shed he was in. Well, there are the two times in which Murdock and Face get shot, but both times, only a single bullet is fired. And in the first scene of the episode "Pros and Cons" (involving illegal prison fights), the warden strides up to the loser and points a gun at him - we don't see what happens next, but a rematch is unlikely. Crazy Enough to Work: It wouldn't be The A-Team without it. Destructive Saviour: If a sane person were in charge of the army, he would've pardoned the A-Team just so that they'd stop racking up billions of dollars' worth of property damage. At the end of one episode, Hannibal claims to be an agent of the Drug Enforcement Agency. The "A" actually stands for "Administration", although it is an easy and common mistake to make. In one first-season episode, it was mentioned that B.A., having been shot, was in need of some blood. His blood type was mentioned as AB-, and it was presented as a crisis that no blood of that specific type was available. In reality, AB- can receive blood from any Rh-negative blood type. B.A. Baracus in Latin America is called Mario Baracus and is voiced by Mario Sauret. For the French, B.A. is Barracuda. In Italian, to keep the "bad attitude" pun, it's P.E. Baracus (short for "pessimo elemento", that is, "bad element"). Dude in Distress: Face sure did seem to get captured a lot. Episode on a Plane: "The Beast from the Belly of a Boeing". Everybody Lives: All the freaking time. Every Car Is a Pinto: But we always see the goons crawling away, safe and sound. Fakeout Escape: Hannibal effects an escape by hiding under his bunk and deceiving his captors into believing he has escaped; they leave the cell door open, and he makes a break for it. Five-Man Band: At least for the first two seasons. And the fifth season, when Frankie Santana joined. They follow the Always Sunny model much better, actually: Hannibal is The Brains, Face is The Looks, Murdock is The Wild Card, and BA is The Muscle. The Useless Chick was a variety of, well, useless chicks. Flatline Plotline: The team is executed by firing squad at the start of the last season. It doesn't take. Friend to All Children: B.A., amazingly enough. The Fun in Funeral: Hannibal's faux funeral in "The Big Squeeze". Murdock at first believes it to be a wedding, and later plays "Take Me Out To The Ball Game" on the organ, complete with the upbeat ending normally heard at a ballgame. General Ripper: General "Bull" Fulbright, in Season 4. Gentle Giant: B.A. Baracus, whenever women and kids are present. Heel Face Turn: General "Bull" Fullbright, shortly before he was Killed Off for Real. Hired Guns: The eponymous team, of course. In the fifth season episode "The Say U.N.C.L.E. Affair", the series paired Robert "Napoleon Solo" Vaughn (playing regular character General Hunt Stockwell) with former co-star David "Illya Kuryakin" McCallum. The episode "The Spy who Mugged Me", with Murdock posing as a James Bond-like spy in a Monte Carlo casino. Hypocritical Humor: "Nobody's named John Jones." - John "Hannibal" Smith, "Mind Games". Improbable Piloting Skills: Murdock, of the "If it flies..." variety. Improbable Weapon User: The A-Team has welded together and used weapons ranging from soda cannons to cabbage guns. These are always more efficient than the machine guns their opponents typically use against them (or vice-versa, for that matter). Colonel Lynch in Season 1, with a one-shot return in Season 3. Colonel Decker in Season 2 and 3. Temporary Substitute Colonel Briggs in a single Season 3 episode. General Fullbright in Season 4. I Want You to Meet An Old Friend of Mine: "The Say U.N.C.L.E. Affair", in which Robert Vaughn is kidnapped by his "former partner" David McCallum. I Will Show You X: B.A. would often respond in this way to whatever nonsense Murdock was spouting. Some of them barely made sense, but Murdock didn't always give him much to work with, and B.A. doesn't like to mince words. Killed Off for Real: General Harlan "Bull" Fullbright in "The Sound of Thunder". Knight Errant: A team of Knights Errant, in fact. Lampshade Hanging: At the end of the episode "The Crystal Skull", the natives are clearly chanting "Who wrote this? Who wrote this?" Let's Get Dangerous: When Murdock stops acting crazy and started being Badass, usually at an episode's climax. Locking MacGyver in the Store Cupboard: The A-Team tends to get locked in barns or garages full of machinery and explosive things. Lampshaded in one episode by Hannibal. Hannibal (after a giant truck of destruction has burst out of a shed): Where, exactly, did you lock up my team? Bad Guy: In the old equipment shed. Hannibal: What an original idea. I wonder where you came up with that one. Lunatic Loophole: Murdock occasionally ends up being the only member of the team to escape arrest. MacGyvering: Generally once an episode, involving vehicles. Metallicar Syndrome: Since their van had a custom paint job, the authorities should have spotted them a lot more often than they did. Face Lampshades this in the Season 2 episode "Steel" when Hannibal tells him to keep tailing the episode's villain in his Corvette, which was white with black trim and a bright red stripe along the sides. Face says that the villain will definitely be able to tell he's been following him. More Dakka: The team's M.O. Mr. Fanservice: Face. He probably also counts as a Parental Bonus since the show was technically aimed at children. Nitro Express: There was an episode where they were transporting dynamite - which is not normally volatile until/unless it has a blasting cap attached - but it was really really hot and as a result the sticks of dynamite were sweating nitroglycerin. Nobody Can Die: Since it was classified as a children's show, you have the ridiculous premise in which the A-Team amasses a massive arsenal of machine guns and weaponry, faces off against a similarly armed force, exchanges thousands of bullets -- and everyone lives. It wasn't until the series 4 finale that a recurring character actually died on camera. Discussion of a death was permitted, and you see at least two people executed (with Gory Discretion Shot at the ready), at least in the first couple of seasons. No One Could Survive That: In one episode, a helicopter crashes against a cliff, explodes, falls down, explodes again... and then bad guys crawl out from it. Novelization: There were ten books published in the 1980s; some (like When You Comin' Back, Range Rider?) were based on double-length episodes, others blended together two basically unrelated episodes (like Bullets, Bikinis And Bells, based on "Bullets And Bikinis" and "The Bells Of St. Mary's"). Only one book was based on one standard-length episode (Till Death Do Us Part) and only one wasn't based on an episode at all (Operation Desert Sun: The Untold Story). The first six books came out in the US and UK, the rest were published only in the UK. Obfuscating Insanity: Murdock. Combines with Obfuscating Stupidity to make his awesome moments of competence seem even more awesome. He's probably one of the supreme users of this trope. Murdock did it so well that it was unclear whether or not he actually was so traumatized by Vietnam that he did go insane, he was always like this, or it was all an act to throw people off. One episode had Murdock discharged by his doctor, claiming he was never insane. Without his particular character trait, Murdock essentially spends the episode moping but acting reasonable. When he goes back to the hospital to gather his things, he finds out the doctor had gone insane and was releasing patients because of it. Murdock quickly and happily goes back into the insanity ward. Obfuscating Stupidity: Murdock plays this to the hilt whenever possible; Hannibal and Face aren't averse to it either. Omniglot: Murdock can speak several languages, claiming that one day he had a headache and could suddenly speak several Asian languages fluently. He also imitated various accents several times per episode. Hannibal, in disguise, contacts the clients of the week. B.A. says about Murdock, "The fool is crazy." (or some variation on that). The team breaks Murdock out of the insane asylum (until he's released in the final season). B.A. gets tricked into being drugged so they can put him on a plane. ... followed by a climactic Final Battle featuring lots of A-Team Firing. Other things that tend to happen a lot are Face jumping off the top of a van onto a bad guy, and Hannibal punching someone out and then putting a cigar in his mouth. Amy and Tawnia for the dads. Police Are Useless: Multiple episodes established this quickly to explain why the client of the week needed to approach the A-Team instead of the cops to deal with the villain of the week. The cops were usually just being bought off by the villain in question, though sometimes the cops were the villains. This ended in the final season due to the change in format. Posthumous Character: Ray Brenner was a fifth member of the team in Vietnam whom the others remember heroically. They risk capture to attend his funeral to learn that he died trying to free his town from outlaws, before seeking revenge for their fallen comrade. Product Placement: An odd case. The van was supplied by GMC, but the grille and emblems were then either blacked out, obscured by a brushguard or removed entirely making it indistinguishable from a Chevrolet. Pro Wrestling Episode: "Body Slam". Punch-Punch-Punch Uh-Oh: B.A. was the unusual protagonist example who'd let the mook get in a good punch or two before smiling, then defenestrating them. Inverted twice when B.A. met a giant Asian mook who could take his punches without flinching. Ruthless Modern Pirates: "El Cajon" (The Coffin) and his river pirates in "The Bend in the River". Robber: Where'd you learn to drive like that? Murdock (deadpan): I saw Cannonball Run five times. Shoot the Rope: Murdock owes his life to the sudden burst of Improbable Aiming Skills Hannibal gets when some Mooks use his life to try and get information out of B.A. Shout-Out: "Howlin' Mad" was originally the nickname of World War Two General Holland Smith of the United States Marines, although today Howlin' Mad Murdock is a lot more well known than Howlin' Mad Smith. Amy in season one and half of season two. Tawnia for the rest of season two and the beginning of season three. Special Guest: Later in the show's run, when ratings started to slip. Some appearances included Rick James, Boy George, and Hulk Hogan (in two episodes, nonetheless). In "There Goes The Neighborhood", the rock star our heroes had to guard was set to be played by Cyndi Lauper, but it fell through. Spell My Name with an "S": Many people spell Tawnia's name as "Tanya", between the strange spelling of her name and the fact that even the show spelled it wrong in her first appearance. Stay in the Kitchen: George Peppard worked to keep women off to keep it an "all-male" show. Though he was mostly cordial to the actresses, Marla Heasley spoke of feeling unwelcome on the set and in particular that Peppard told her on both her first and last episodes that nobody wanted her there except the network. Suspiciously Similar Substitute: Tawnia, who replaced Amy midway through Season 2 and stayed through part of Season 3, filled an identical role of a reporter and The Chick. Temporary Substitute: For a single episode in Season 3, Decker was replaced by Colonel Briggs, who was simply intended to be a one-off character when Decker's actor, Lance LeGault, had a scheduling conflict. Briggs even mimicked all of Decker's mannerisms. Too Dumb to Live: Far too many little, unarmed Mooks pick a fight with B.A. The Triads and the Tongs: "The Maltese Cow", which dealt with a Chinese restaurant being threatened by a Chinese tong. Hannibal and Face can also fit this, to a slightly lesser degree. Trojan Horse: The team uses one to sneak into an enemy base. The horse was a delivery truck full of whiskey, and the base was a convent which had been taken over by South American guerrillas, who had recently run out of booze. Unintentional Backup Plan: Frequently, prompting Hannibal to spout his Catch Phrase, "I love it when a plan comes together." Unwitting Pawn: Stockwell sets up the team in the final season. The Vietnam War: The A-Team of course, as well as Decker, having served in the war. The show is credited as being one of the first to portray it, and in a positive light to boot. "A Nice Place to Visit" had the A-Team attend the funeral of a soldier in their unit, with each character descending into hero worship over his actions in Vietnam before going on a Roaring Rampage of Revenge against his killers. Vitriolic Best Buds: Murdock and B. A. are a firm Type 2. Murdock (while B. A. is knocked out): I'm worried about him, Hannibal. It's been almost a full day and we haven't insulted each other--I think I may go into withdrawal soon. Walking the Earth: Because they're wanted by the military, though they typically stick to the Los Angeles area. They occasionally travel very far afield (most notably in a lot of season five, and in the season four premiere "Judgment Day"). We Help the Helpless: As explained in the opening narrative. Why Did It Have to Be Snakes? : B. A. 's fear of flying. He ended up giving one exception in one of the later episodes, when he learned that his mother was attacked by thugs; even then, he still had to be sedated within several minutes of flying. In another episode, he decides the cause (getting them pardoned) is enough to go on a plane; he still ends up passing out, but it's ambiguous whether they drugged him anyway, or whether he just went comatose (which happened on an early episode where he ended up on a plane). Would Hit a Girl: In one episode the gang are rescuing a kidnapped woman from the compound of a militia. She resists them because she's fallen in love with one of her captors. Since they're in a shoot out, Hannibal just knocks her out (offscreen) before resuming the rescue. X Meets Y: NBC President, Brandon Tartikoff pitched the series to Stephen J. Cannell (the co-creator) as a cross between The Dirty Dozen, Mission: Impossible, The Magnificent Seven, Mad Max, and Hill Street Blues, with Mr. T driving the car. This page was last edited on 9 April 2017, at 20:38.